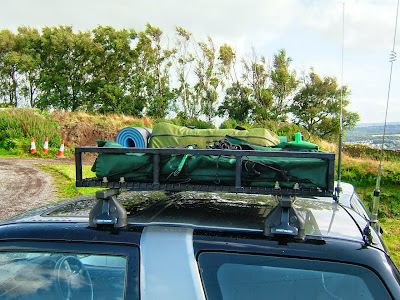 I decided to put together a "Safari" style roof rack for my Toyota RAV 4 mobile Ham Station using some mesh, square tube and a bit of M.I.G Welding. The receiving is done with the Yaesu FT-847 Transceiver and IOIo Antenna. I managed to get a good image earlier this evening using the above setup. The received image shows the north Coast of Africa up to the Arctic Circle, as you can see there is a lot of cloud rolling in over the U.K. You can also see the "Grey Line" as the Sun is shining to West. 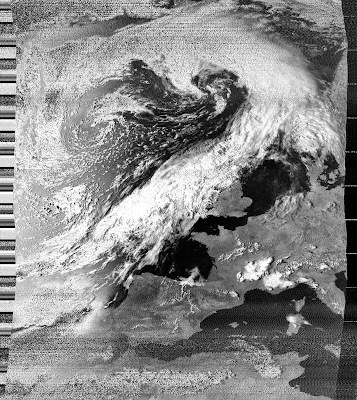 I received the above WX image on FM, from my ground station at 16.45 utc on 137.500 MHz + or - Doppler, courtesy of NOAA - 15 Weather Satellite. 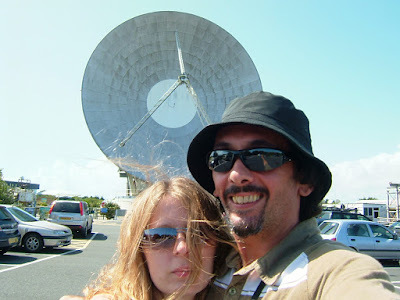 Since the last post I have been up to my usual antics and started the week by working Paulo CT1ETE in IN51UK – Portugal, via the SO-50 Satellite, Paulo first contacted me via email to arrange our first QSO. I continued working plenty of interesting Stations via the “Birds” with lots of success throughout the week. The FT-847 DSP filters have been doing a fine job dampening down the unwanted noise on the FM down links, as well as cleaning up the distant voices making them much more readable and easy to copy. HF has also had its moments this week, especially late on Thursday evening where I was fortunate to be on 20M during some nice DX openings. I worked LU5FF –Argentina, WD8CCC - U.S.A, FM1HN – Martinique, HI3TEJ - Dominican Republic & TI2AIM - Costa Rica. 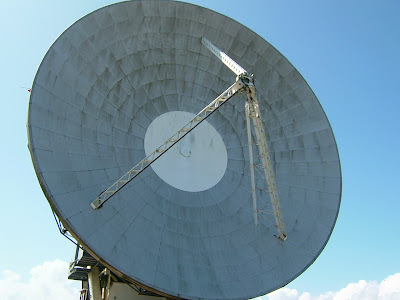 The 20M band was in good shape that night as all Stations were good signals and were worked on the FT-767, Delta Loop antenna and 50W of output PWR. I haven’t heard conditions quite as good on 20M since then, however I usually monitor the band most evenings before I go to bed and I am often lucky at that time (23.00 -00.00 local) with frequent DX openings. Saturday I decided to give the new vehicle a run out, so Louise M3TLL, Dudley and I set off in the East Coast Direction after a hearty breakfast. We arrived at Fraisthorpe beach (near Bridlington) and spent a couple of hours paddling around in the calm, sun warmed sea. It was very nice to catch the sun and be on a Yorkshire beach all at the same time (a rare opportunity for good WX) and afterwards we headed up the coast to Bridlington on the hunt for some food. 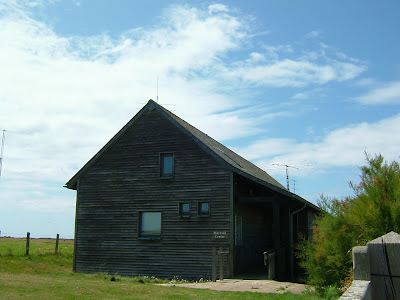 It was there that I heard fellow CRAG member Chris – 2E0XLG, calling from the Flamborough Light house, located further up the coast. He was as surprised as I was when I made the qso on 2M fm. 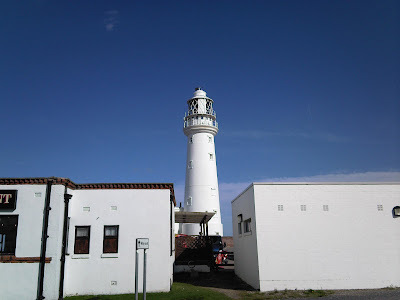 Chris was operating from Flamborough for Light Houses on the air with the North Wakefield Club using a special event Light house Call sign - GB2FL. 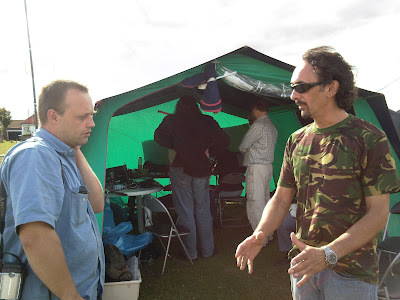 Andy – M0GGR arranged the call sign for the club and kindly invited Louise and I to visit the site where they were operating from. 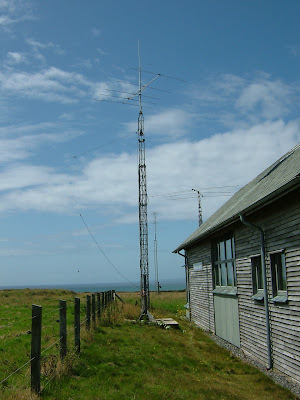 Robin G1MHU running his Icom and worked me earlier under GB2FL The Flamborough Light House UK0006, East Yorkshire. One of the F.L Coast Gaurd Antenna Arrays. 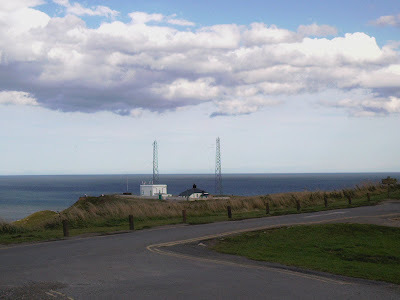 The GB2FL Station was operating on HF and VHF activating Flamborough Head Light House as part of the International Lighthouses On The Air weekend. The Special Event Station was on the Air thanks to "Tyke" and the rest of the North Wakefield Club and is an annual activation with the GB2FL Call sign. N.W.R.C - Thanks for the invite and the friendly hospitality, We both enjoyed it very much. 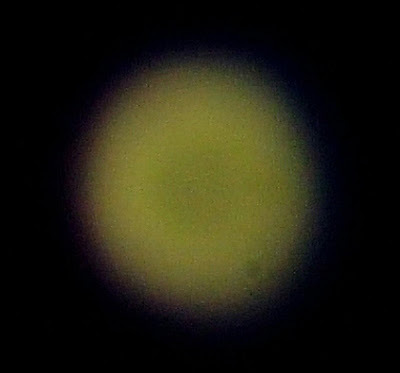 Back on Baildon Moor later on Saturday evening, I noticed Mars was particularly bright due to the clear night sky. I was still hoping for the odd late meteor after only seeing six the other evening when the Perseid's were supposed to be peaking. 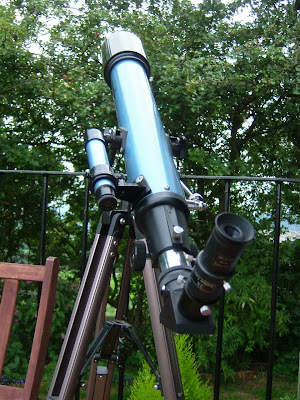 I set up the little 70MM SKY Watcher Telescope and began peering at Mars. 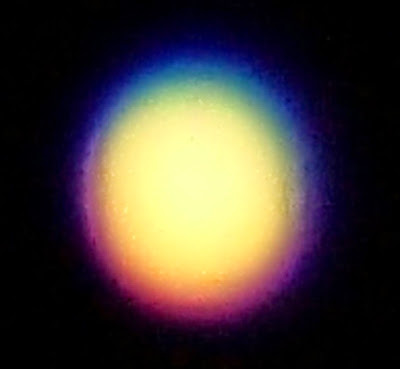 I could see some spectacular colours been reflected down the tube from the Red Planet. 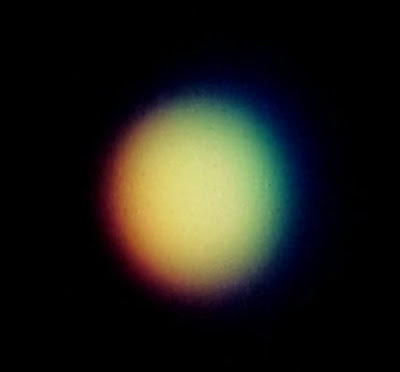 I decided to try some experiments with the old camera and came up with some interesting pictures. Here is the latest vehicle to house the amateur radio equipment I use whilst working mobile. It follows a long line of previously owned Toyota's as it is my 7th Toyota/ 2cnd RAV-4. We decided to change from the Estima whilst paying out a fortune in diesel during our recent visit to Cornwall, were loosing a bit of space but gaining more miles to the gallon and these days with things around the World been so tight it seems a good idea. 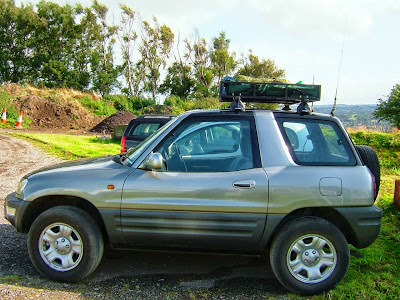 The latest RAV is in very condition and has low mileage with only one previous keeper, it should be good for a couple of years of DXing and touring around. Some of you already know that my journey to work is often undertaken on one of my 4 motorcycles, which I enjoy very much (apart from not being able to play radio on the motor cycle). 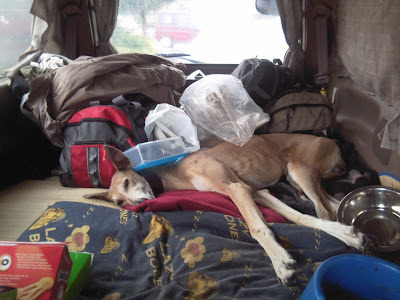 The vehicle will be used purely for Ham radio, dog transporting (Dudley likes to travel in style) and holidaying/touring around, not forgetting those freezing cold icy winter days that are a bit dangerous on two wheels. So as you can imagine, I have had my tools out once again installing the radio equipment and antenna systems into the new Toyota. I started of with the antenna mounts which would house the HF antennas(maldol mono banders)and also the dual band VHF antenna(Watson 2m/70cm). It is very important to get a good earthing to the vehicle especially for the HF antennas to work properly. To ensure this, I use mounts that grip the vehicle rear door which work by using small grub screws. 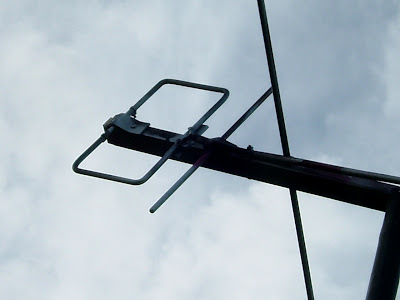 The Vhf mount is also fixed in the same way, make sure any feeders are secured using plastic cable ties and are routed to avoid the coax from being crushed. See the picture below. The next job was to wire in the power direct from the Toyota's battery, through to the interior via the bulk head enabling a good supply to the Yaseu FT-857. I always double fuse fit the harness conveying the 12-13.8Volt supply as the load drawn from the battery is around 20 amps and could easily start a fire if a short circuit occurred. By placing in line fuse protection close to the battery poles and also close to the equipment/radio the risk of any damage is minimised. I also like to fit some small ferrite chokes on the Yaesu FT-857 power lead and also to the Toyota's engine management system(brain). This can cut down any unwanted noise as well as preventing any RFI entering into the vehicles electrical system. Once the antennas and power feeders were wired in place,the next job was to fit the little FT-857 into the dash board. The location for my personal preference is just below the CD player (which I also installed at the same time)the MIC can be fixed with various brackets which I have yet to do. This picture shows the Yaesu FT-857 fixed in place to the vehicle receiving well. 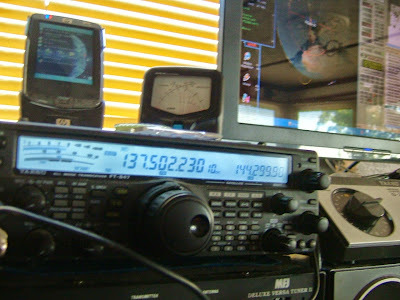 Another view of the Mobile FT-857 installation. The set is working very well as usual, I have already made some nice QSO into Switzerland, Lithuania, Italy and I heard some Middle East stations coming through 5/9+. I am looking forward to many more miles of ham radio mobile operations with this new/second hand vehicle. 73 have a nice weekend. Tuesday evening I was once again active during the monthly VHF contest on 2m ssb. This months contest started off well and continued to be a good evening, I worked 29 stations in total over 2 and a half hours. 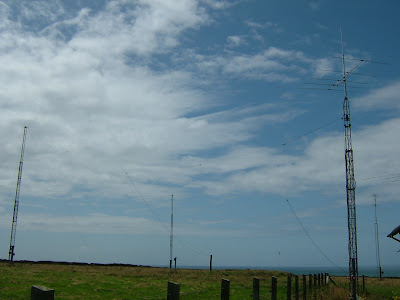 I managed to make qso with Scotland, Isle of Man, Wales, Northern Ireland and England gaining 11 multipliers, 65461 points, with the furthest contact being G0XDI/P at a distance of 328KM in JO01KJ. As usual I was running the Yaesu FT-847 and 30 watts output power through the IOIo antenna fixed at 30 degrees elevation, 260m ASL. Since I made the latest antenna I have noticed significant improvements to signals making the normally unworkable weak signals sound much stronger. It is amazing what difference can also be achieved by installing good quality low loss coaxial cable as feeder. 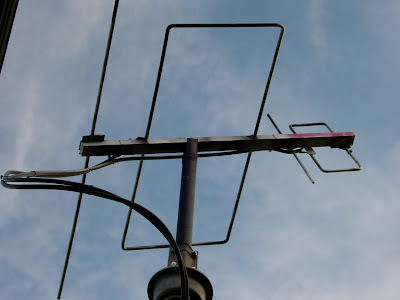 I did this the last time I fiddled with the antenna. This year has been the first year that I have taken the RSGB 144 activity contest serious and considering the majority of other ops are running more power and have some nice big arrays, I've been very pleased with the results so far. The new antenna has also been working well for me again with the Satellites, last night I managed a couple of nice QSO on AO-51 and once again I was very strong into VO-52. I am hoping to get some time in and receive some ISS SSTV images that are being transmitted from the space station over the weekend. 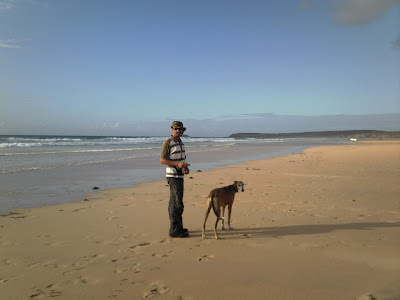 The past three weeks went very quickly, I spent my time holidaying away from work. I managed many things which included some serious mileage up and down the Country whilst on our tour. 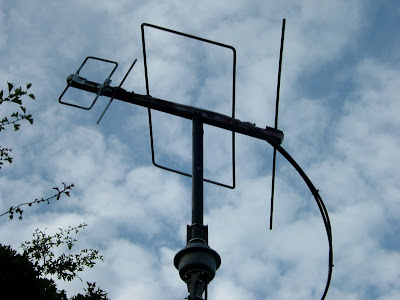 I started off the holiday by getting stuck in to the project that has kept me busy for over 12 months, which was of course to decide which of the many homebrew /adapted antenna (IOIo or Yagi) would work best for me on the satellites. This was to be the antenna that is more usable on both the FM Satellites and the SSB Satellites, when set at a fixed elevation. In my case I have chosen a 30 degree inclination which has shown to provide good signals from 10 degrees up to a 50 degrees Pass on VO-52 (SSB Sat). 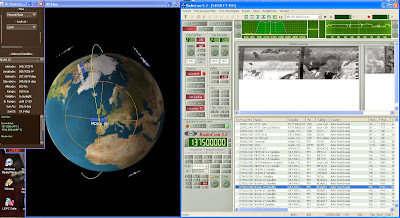 Passes at 20 – 40 degrees can be worked quite well for the FM Sats such as AO-51, SO-50 and AO-27. I have noticed a distinct benefit using the 435 part of the antenna Vertically Polarised. I have had much better incoming signals from the “FM Birds” since I adopted this layout. The signals are still fairly weak but readable, I don’t suppose I can complain considering the Sats are only putting out 620 MW. I certainly would love to get my hands on a decent 70cms preamp, it would aid the excellent Yaesu FT-847 and an elevation control would be very, very nice indeed. In the meantime here is the final Cross boom assembly IOIo. The next stage of the holiday was spent burning lots of diesel as we set off down to Cornwall In the south of England. On the way down I made some QSO on 20m during the journey operating the Yaesu FT-857 and Maldol mono band mobile antennas. 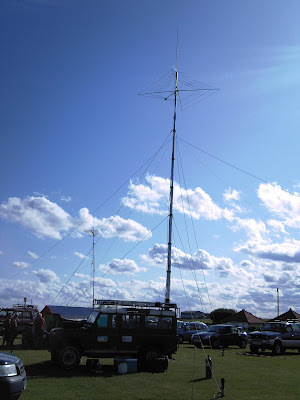 Playing /mobile Ham radio is in my opinion the best way to keep alert on the road during long hauls and I enjoy the challenge making low power world wide contacts from the mobile very much. 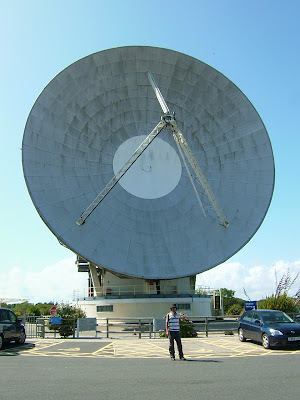 Once we arrived at our on route Campsite which was in Devon, we got some sleep and in the morning I changed the antenna to the 40M Maldol mono bander. 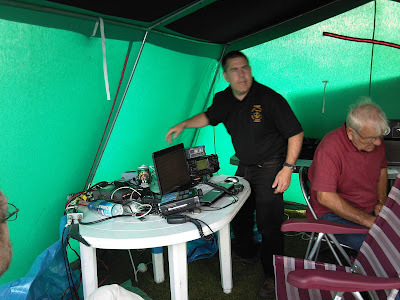 I made a lot of QSO that day on 40M as we continued to Cornwall and once we arrived the band became open back to Yorkshire and at 400 miles distance, I had long time buddy Keith -M0TKD in the mobile Log close by to Lands End 5/9 +. I worked a number of stations that day and they can be seen in the earlier posted log. The next Day we met fellow You tuber and Radio Ham Lawrie M3UHQ from Penzance. I made Lawrie a Cup of Coffee on the good old Coleman petrol stove and it was great to finally meet him. 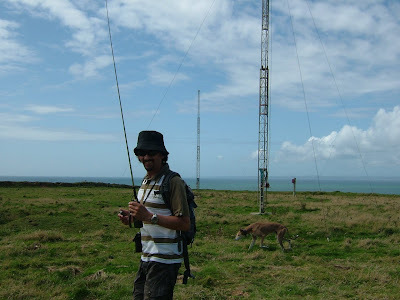 Later that day we went to the Marconi Centre located on the Lizard Point I set up with the Yaesu FT-470 but the 2m/70cms band was very quiet. Back in the mobile parked up on the Marconi Site I caused a nice little pile up on 40m and made it across the pond in true Marconi style on 20m. 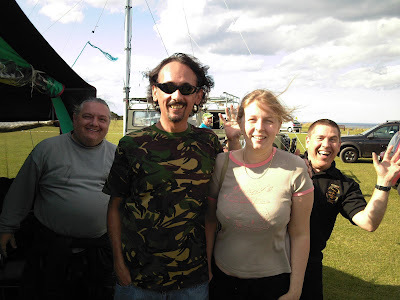 The recently posted video shows some of the activity from the Marconi centre in case you managed to miss it hi. 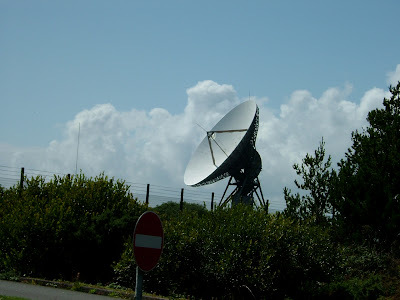 The next place of interest that we got the opportunity to checkout was Goonhilly, which as you can imagine was very exciting to a Satellite addicted Operator, like myself. 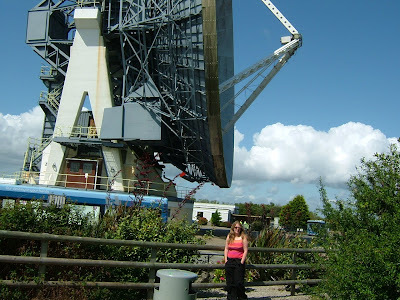 The YL Louise – M3TLL also enjoyed both radio related visits very much as well. The little FT-857 saw some action during our holiday and performed well. As far as the Vehicle,it is very expensive to run. We will be saying good bye to it and collecting our newly purchased second hand Toyota Rav 4 (much more fun and more economical). More about reverting back to the Rav 4 and the new installation in the very near future. Thanks for passing by 73. 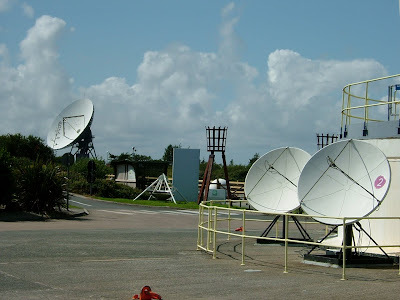 During my mobile operation whilst on holiday in Cornwall I managed to work a number of stations operating mainly on 20 and 40m. 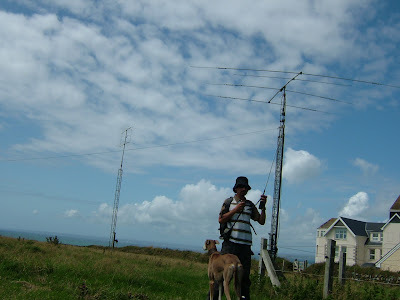 I was using the good old Yaesu FT-857 and the Maldol monoband antennas.